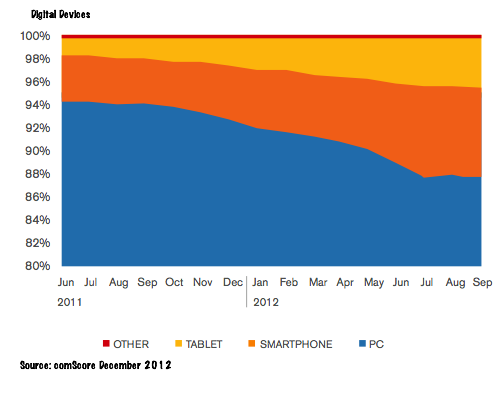 2012 was [finally] mobile’s year. Mobile, including both smartphones and tablets made significant jumps forward. Always within arm’s reach, they’ve become an integral part of our lives. As a result, consumers expect a seamless digital experience regardless of the device they’re using. Over 120 million people in the US own a smartphone, an increase of 30 million over last year according to comScore. 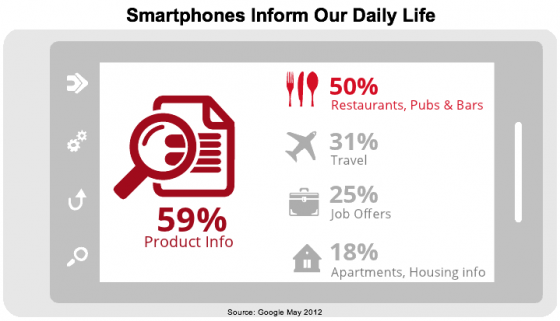 Smartphones account for over 50% of all mobile phone users. Further, over 48 million people own a tablet, a growth of 300% from last year. To-date, the tablet is the fastest growing electronic device. Smartphones and tablets continue to take an ever increasing share of the digital media landscape. According to comScore, they account for about 15% of digital media consumption. 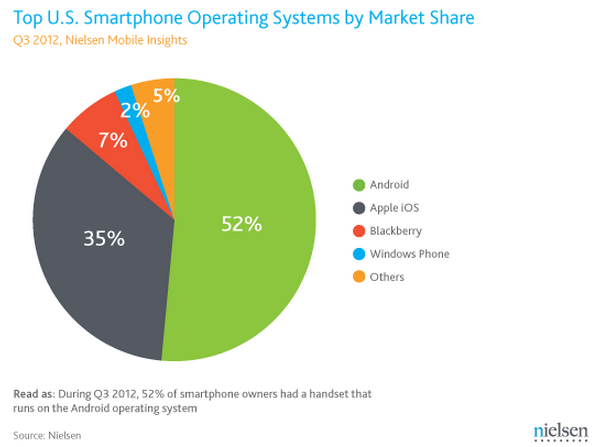 Android (aka Google) dominates the US smartphone operating systems with over half of the market while Apple has over a third of the market according to Nielsen. While smartphones are most often used at home, over 80% of smartphone owners don’t leave home without them according to Google. Further, 66% use their smartphones to access the Internet at least once a day with greater use anticipated. About a third of users would give up their television before they give up their smartphone. 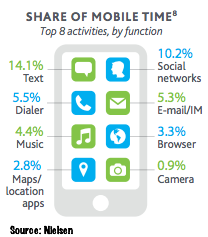 The top three mobile activities are texting, using social media and telephoning. Email/IM place fourth. This decline in the use of email can be attributed to greater smartphone choices beyond email-focused BlackBerries. 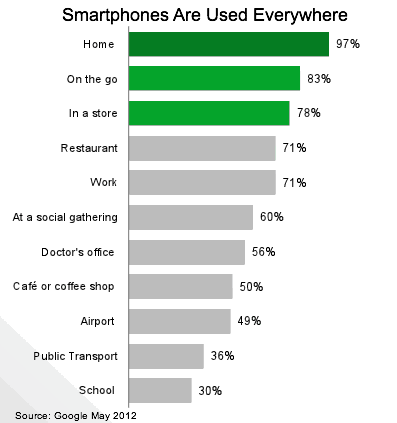 74% U.S. smartphone users get real-time, location-based information on phones according to Compete. 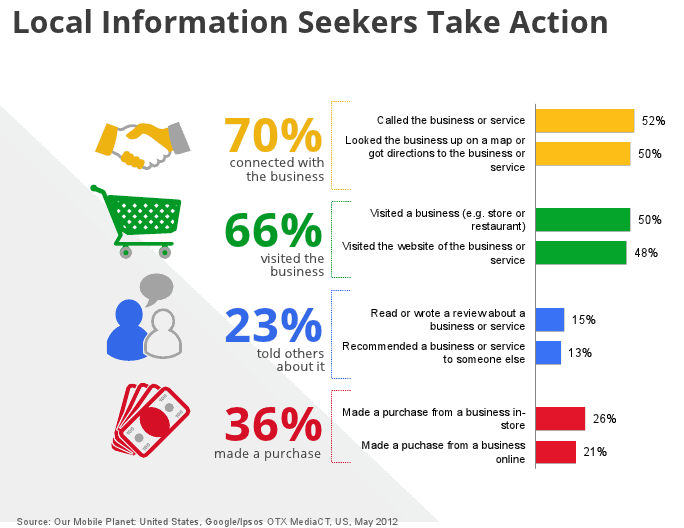 94% of users look for local information and 90% take action based on it according to Google. 27% of respondents do so daily. 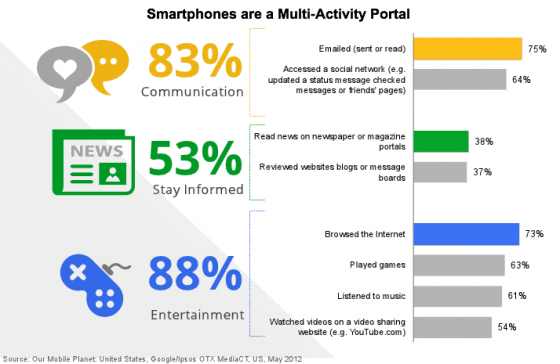 Games tops content activities on mobile for both smartphone and tablet owners. Smartphone owners have installed 28 apps, used 11 apps in the last 30 days and paid for 6 apps, on average according to Google research from May, 2012. US consumers spent an average 127 minutes on mobile apps per day. That’s up 35% from the 94 minutes spent per day in December 2011 according to Flurry and reported by eMarketer. Top of the app list was mobile gaming accounting for 43% of time spent with mobile apps worldwide, social networking accounting for 26% of time spent with mobile apps worldwide, and entertainment and utility accounting for 10% each of the time spent with mobile apps worldwide. 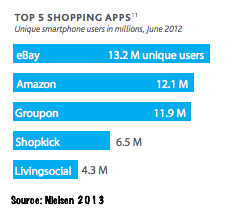 Interestingly, only two of the top five shopping apps are associated with retailers. Both eBay and Amazon have used their shopping apps to help them compete against brick and mortar retailers. Additionally, Amazon is a shopper’s Wikipedia providing product information, images and reviews. For marketers, mobile is just another way of reaching their target audience. Top of marketers list of mobile objectives is, you guessed it—sales! 57% of users use their mobiles to search everyday according to Google. 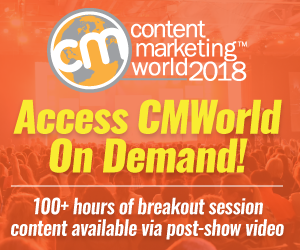 70% of mobile searches lead to action within one hour versus within one month for online searches, based on information from Direct Marketing News via Compete. US ad buyers plan to increase their mobile advertising buy to as much as 5% of their total ad budget over the next year according to a survey by Cowen and Company and reported by eMarketer. Worldwide mobile advertising increased to $8.41 billion in 2012, according to eMarketer. While forecasts continue to show strong growth as advertising follows usage, the growth percentage will continue to decrease. In 2012, mobile advertising in the North America surpassed Asia Pacific, a trend that is expected to increase in the next three years. US mobile ad spending, including display, search and messaging-based ads served to mobile phones and tablets, is expected to reach $7.19 billion in 2013 according to eMarketer. 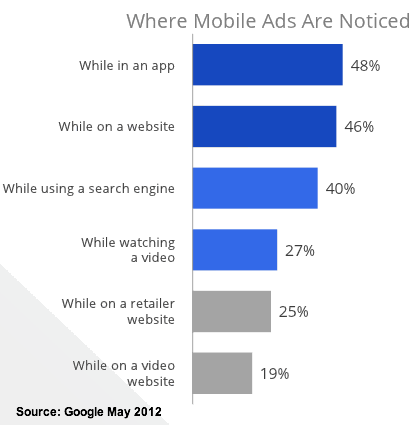 Mobile ads get noticed by consumers. About 30% of marketers think that their mobile ad investments are effective. This means that marketers and media firms need to find ways to improve mobile advertising efficiency. 76% of smartphone owners watches video and 25% watch it every day according to Google. 92% of mobile video viewers share mobile video content with others according to a November 2012 study by the Interactive Advertising Bureau (IAB) and reported by eMarketer. While 56% of respondents shared videos via posts on Facebook or similar social sites, more than two out of five just shared their mobile device. A third of viewers shared videos weekly. 74% of people say they’re more likely to return to a mobile-friendly site in the future. 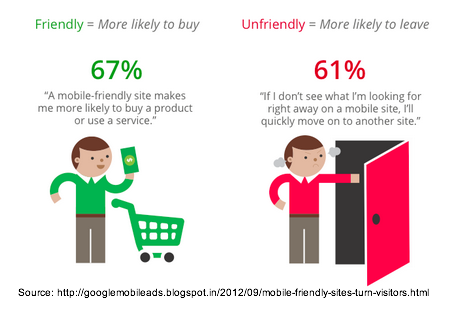 67% of mobile users are more likely to buy when they visit a mobile-friendly site. 79% of people who don’t like what they find on a site search for another site. 50% of people, even if they like a business, will use it less often if they don’t have a mobile-friendly website. Overall, m-commerce is growing at a rate of about 30% per year according to comScore. Shoppers use a combination of smartphones and tablets to shop. Consumers increased smartphone use to access purchase-related information by 50% in the past year alone. About 13% of all e-commerce transactions during the holiday shopping season were completed using a mobile or portable device; tablets accounted for roughly 70% of the total according to comScore. 78% Check to find a store location. 61% Check information on specific products before buying. 68% Check information on specific products before buying. As more shoppers own smartphones, they’re using them to aid their shopping activities. Top on shoppers’ list during the 2012 holiday were researching products, purchase and using a retailer’s email offer. Interestingly QR codes that don’t get much mention these days were used by over a quarter of shoppers. Don’t make the mistake of thinking that mobile shopping is just kid stuff. While younger age groups use their smartphones more frequently, more than a third of boomers use their mobile devices to shop. 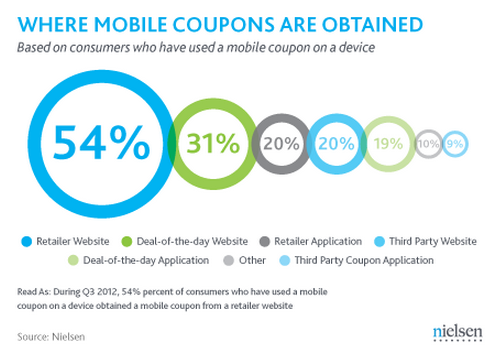 Mobile coupons: Show me the savings! 2012 US retail m-commerce sales, including all purchases made via smartphones, tablets and other mobile devices, excluding sales of travel and event tickets, increased to almost $25 billion according to eMarketer. 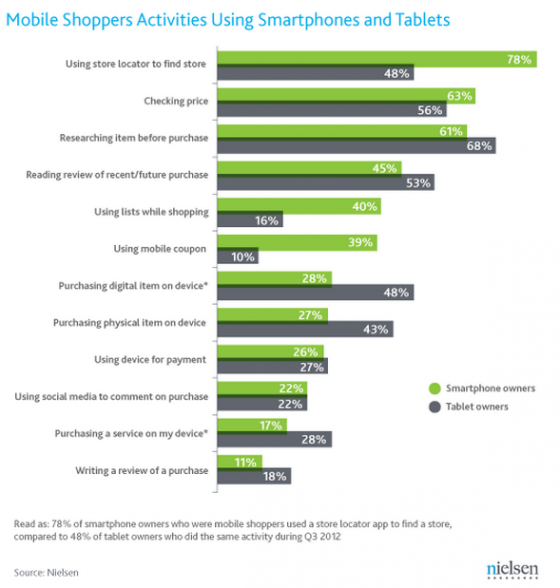 This is attributable to both smartphone and tablet use for shopping. Over time, tablet commerce will overtake smartphone commerce. This makes sense since couch commerce is used for research and tablets are slowly becoming the personal device of choice. 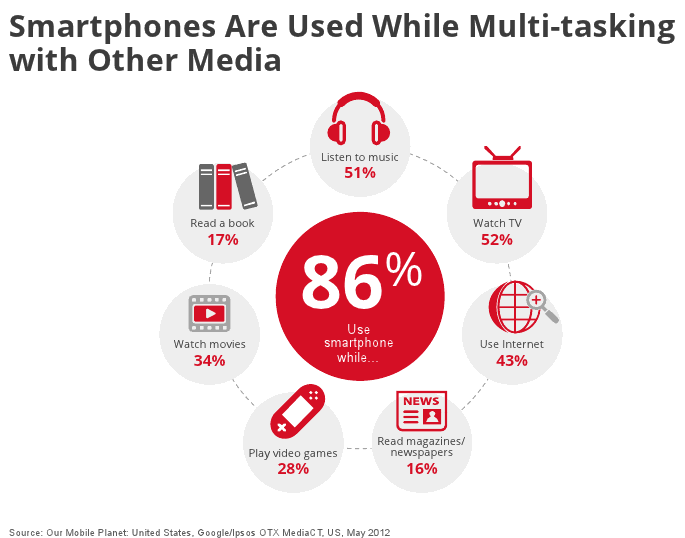 With a smartphone or tablet always available, we’ve become multi-tasking addicts using multiple screens. Of course, it’s important to understand that we multi-tasked before we had mobile devices. We just do it more and with different devices now. With the increase in smartphone and tablet ownership, there’s been a concurrent increase in multi-screen usage. According to Gian Fulgoni of comScore, “one of the most intriguing findings was that alternative screens are additive.” There’s no evidence that incremental screens cannibalize the use of other screens. Media consumption is apparently not a zero sum game. Consumption increases across all screens as more screens are used. 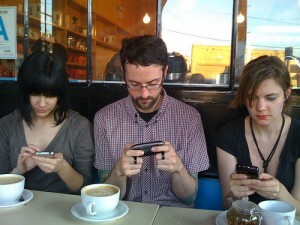 The bottom line is that every marketer must make mobile a critical aspect of their 2013 marketing plans. Tags Advertising, Android, Apple, comScore, eMarketer, google+, Nielsen, Search. Bookmark the permalink. Great layout of the facts! Thank you. Thanks for a great, thorough analysis of mobile marketing. For me it’s rather sad. I’ve completely ignored that segment of ad market with no optimiization for mobile devices. I can see now it’s a must if you want to launch a serious ad campaign. 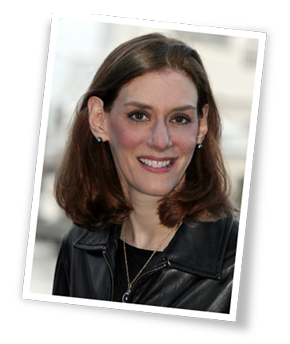 Wow Heidi a lot of very useful information with graphics on mobile, thank you for a great article. Mobile is most definitely on the move!